Pimento Cheese is a culinary institution in the South, sitting on a pedestal between sweet tea and cornbread. Ask anyone who grew up below the Mason-Dixon line, and they’ll share memories of their grandma combining grated cheddar, a heap of mayonnaise and a jar of pimentos into a popular potluck dip. These days, Nashville chefs are elevating pimento cheese with better cheeses, less mayo and often smoked spices, making it a can’t-miss component of local menus. With National Cheese Lover’s Day coming up on January 20, it felt like a fitting time to point toward some of Nashville’s best takes on this Southern staple. Whether atop a burger, adorning a hot dog or stuffed inside a sandwich or beignet, these eight Nashville dishes do pimento cheese right. One of only a handful of Nashville-native chefs in the city’s fine-dining scene, Farm House owner Trey Cioccia has delighted downtown Nashville diners with his ever-rotating, locally sourced menu since opening his restaurant’s doors in 2014. One of his menu’s staples: Pimento Cheese Beignets. A savory and slightly denser version than its New Orleans brethren, these deep-fried pockets of dough stuffed with pimento cheese have become one of Farm House’s best sellers, and it’s no surprise why. Served atop a swirl of house-made harissa for dipping, the golden-brown delights are fried to perfection, perfectly crispy on the outside and gooey and melty on the inside, with slightly spicy, mostly sharp and a tad tangy pimento cheese. A unique spin on pimento cheese that transcends comfort food, these craveable creations are one of our favorite bites in Nashville. Hattie B’s’ hot-chicken empire may be nationally renowned and quickly expanding (hello, Vegas), but Nashvillians were eating hot chicken long before Hattie B’s showed up on the scene. Many say that it’s the sides that sets Hattie B’s apart and keeps the locals coming back. In addition to Southern staples like a creamy and cooling cole slaw and red skin potato salad, the Hattie B’s show-stopper is the Pimento Mac & Cheese. Their secret: the roux, which serves as the base for the entire dish. Sharp cheddar cheese is then melted while pimentos are folded in with macaroni, making for a scrumptious counterpart to your choice of chicken. This is no ordinary hot dog, and I Dream of Weenie is no ordinary hot dog stand. Consistently ranked on the list of the nation’s best spots for hot dogs, I Dream of Weenie resides in a retrofitted, permanently parked yellow VW microbus in East Nashville’s hip Five Points neighborhood. The staff slings quirky specialty dogs from the walk-up window for daily lunchtime diners, and all are worth a try, but don’t miss the Pimento Cheese Dog with owner Leslie Allen’s housemade pimento cheese, piled atop a chargrilled all-beef hotdog. The pimento cheese commands center stage in this presentation, giving the perfect amount of kick from the sharp cheddar and those pimentos for a flavor combination that infuses zest into every bite. Starting as a beloved food truck, the Grilled Cheeserie helped drive the mobile food scene forward in Nashville, launching its signature melts in 2010 and quickly developing a cult following. Since then, the GC team has expanded to a fleet of trucks and a brick and mortar in Hillsboro Village, plus a second outpost in Franklin and a third soon to open in East Nashville. While the Grilled Cheeserie sandwich selection continues to grow, one of the original signature melts, The Pimento Mac & Chee, thankfully hasn’t changed since its inception. Combining house-made pimento cheese with macaroni, even more cheese, a slice of tomato and Benton’s bacon bits melted between two hearty slices of sourdough, this sandwich will evoke the best kind of memories for those who grew up eating pimento cheese sandwiches on white bread. For newcomers and naysayers, it’s likely to become a regular pimento cheese craving. 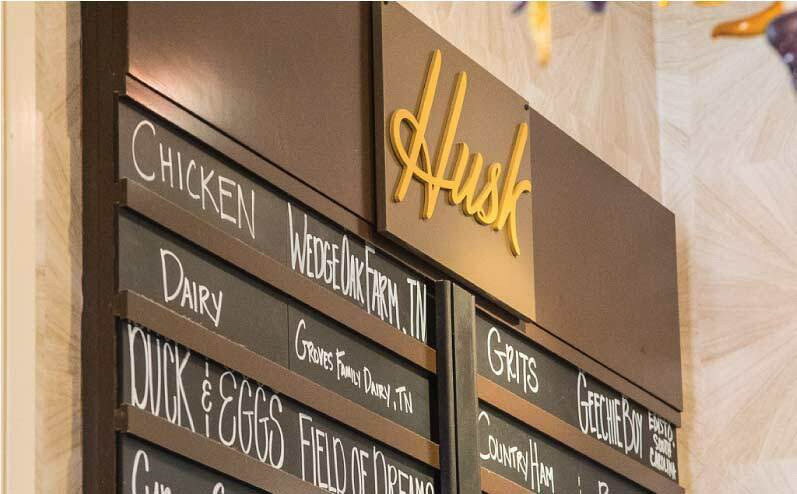 Many know of Husk as the brainchild of culinary rockstar and James Beard winner Sean Brock, although executive chef Katie Coss officially took the helm of the restaurant’s Nashville kitchen in September 2018. She’d been cooking there for years as the executive sous chef, but a new perk of being the boss: switching out the famed Willie Nelson photo in the kitchen for one of her idol, Dolly Parton. Taking the best of the traditional South and reimagining it in a modern way is what Husk does best, and the restaurant’s pimento cheese is a perfect example: creamy but with a slight tang, so it’s not too indulgent, leaving the sharp reminder of cheddar lingering on your palate. 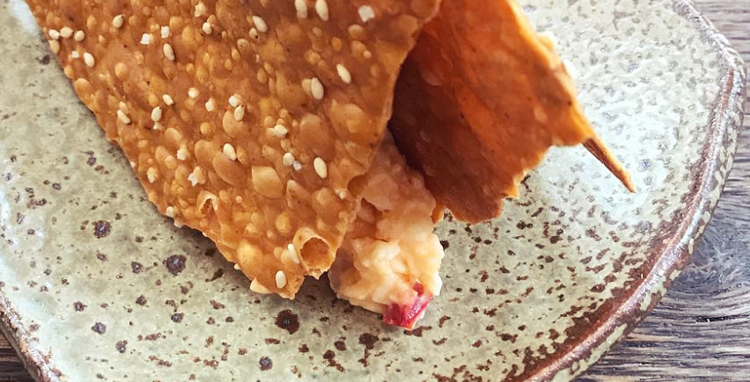 By serving the pimento cheese with its signature Benne Wafers, Husk hopes to introduce diners to an heirloom variety of sesame that’s been all but forgotten over the centuries. Benne seeds, known in kitchens throughout the South, are similar in taste and texture to sesame seeds, but are a bit smaller and darker, leading to a nuttier and more complex flavor. Ground into flour and baked into crackers, these wafers are then topped with plenty of toasted benne seeds. This dish is perhaps the simplest and most straightforward presentation of pimento cheese on this list, but the flavors are flawless. Burger Up is so much more than a burger joint, offering knockout salads and surprisingly delicious vegetarian fare, and, yeah, excellent burgers. Folks believe the Nashville-bred brand’s burger prowess traces back to its ingredient sourcing, entirely from local, ethically inclined farms — happy farms make for happy restaurants and happy diners. One of Burger Up’s happiest burgers is the Ramsey Pimento Cheese Burger, lined with house-made pimento cheese, plus the usual fixings like lettuce, tomato, pickles and onion. Then the kitchen staff ups the ante by adding truffle aioli and Benton’s Bacon, and sandwiching it all between a freshly made jalapeno bun. Extra pro tip: Do yourself a favor and switch out the side of regular house fries for an order of the truffle fries. A beloved neighborhood spot, Silo serves delicious local fare with a southern flair in Nashville’s historic Germantown neighborhood. Grab a patio seat overlooking an intersection bustling with pedestrians and pets for some excellent midday people watching. Order a $6 brunch cocktail (our favorite is the Seelbach), and treat yourself to one of the more sublime BLTs in town. Served on a house-made everything bagel, Silo’s Pimento Cheese BLT (pictured up at the very top, from Silo’s Facebook page) is the perfect mix of smoky bacon and savory cheese spread. We couldn’t wrap this without pointing you toward perfect, already-made pimento cheese for your own creations. Named in honor of Professor John E. Bailey — who introduced music education to all of Nashville’s secondary schools in 1873, and served as the superintendent over music education for almost 50 years — Professor Bailey’s Pimento Cheese has earned a cult following in Nashville in recent years. One taste, and it’s easy to understand why. By blending extra sharp cheddar and Monterey Jack cheeses with pimentos, red bell peppers, jalapeños, onions, vinegar, Tabasco and just enough mayo to bind it all together, Professor Bailey’s signature Spicy Pimento Cheese is hardly reminiscent of the mayo-drenched mainstay of potlucks past. This Pimento Cheese packs a subtle punch. You can take home tubs of the Savory, Spicy and Spicier Pimento Cheese varieties, or grab a bag of the frozen take-and-bake biscuits (they have more cheese than flour) from a number of Nashville grocers, including The Turnip Truck, local Whole Foods locations and The Produce Place, as well as local farmers markets.